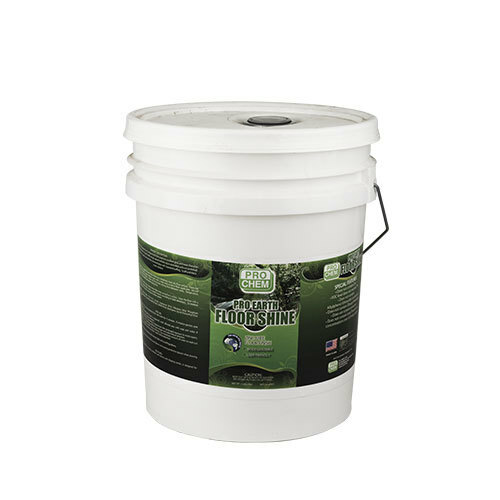 Pro Earth Floor Shine | Pro Chem, Inc. PRO EARTH FLOOR SHINE is an environmentally preferable, zinc-free floor finish that produces a durable finish with an outstanding rich gloss and has superb leveling and black heel mark resistance. It is very popular in the health care industry because it has a low odor and is easy to use in occupied areas. It is suitable to use for both conventional and high-speed buffing programs. Must use PRO EARTH FLOOR STRIP to remove PRO EARTH FLOOR SHINE. Conventional strippers will not work. Only apply PRO EARTH FLOOR SHINE to a completely clean, dry floor surface. Apply medium coats with a clean mop or microfiber applicator. Do not dilute. Allow 20-30 minutes drying time between coats. Temperature, ventilation, and humidity will affect drying time. To bring out the shine, buffing the floor is necessary. Maintenance: Dust mop or microfiber sweep floor surface. Clean the floor with a damp mop or auto scrubber using PRO EARTH NEUTRAL FLOOR CLEANER according to label directions. To increase gloss, spray buff or burnish using dust control systems.